Simply fill in a few brief details below to compare prices for a Home Report on your property by experienced local Chartered Surveyors. You can then contact them directly to compare prices and arrange an date for the survey. This is a FREE service to use and there is no ‘middle man’. 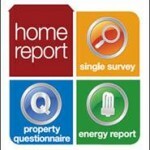 A Home Report is required by law for the majority of homes for sale in Scotland. A copy must be made available to all prospective buyers who ask for it. Chartered surveyors are the only professionals allowed to carry out the ‘single survey’, valuation and energy report (EPC) contained in a Home Report. It also includes a questionnaire about the property. The ‘single survey’ is similar to the popular RICS Homebuyer report – a reasonably detailed assessment by a qualified chartered surveyor of the condition of the property. It also contains an accessibility audit report and a valuation. The Energy Report (EPC) is an assessment by a surveyor of the energy efficiency of the property and its impact on the environment. It also lists possible ways to improve the energy efficiency of the building. The Property Questionnaire is a record provided by the seller of the home. It also contains additional information about the property, such as Council Tax charges and other costs that will be useful to the new home owner. By filling in the form above you will be given a list of estimates directly from surveyors who cover your local area. This list will appear instantly and will provide their full contact details including their addresses, phone numbers and emails. You will then be able to deal directly with any of the the surveyors listed.